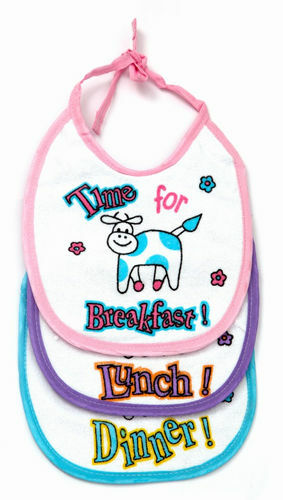 Little's baby bib multicolour pack for your little one ensures that mealtime is no more a messy time. This Little's pack of three comprises three baby bibs made of extra soft cotton terry knit fabric. The soft fabric ensures that your baby is comfortable with the bib around his or her neck. Little's baby bibs are easy to wash by hand or in a washing machine, and they do not change shape even after many washes. Each is bib is labelled for use at a specific meal, namely, breakfast, lunch and dinner. The multi-colour Little's baby bib has a plastic back that ensures that the food or water fallen on the front does not seep through and stain your precious baby clothes. The knot type loop allows you to adjust the bib as per your baby's convenience and comfort.